Andrea Baroni is a self-described 'multimedia artist and digital storyteller.' But he is probably best known as the keyboard player for Italian progressive metal band Icycore which currently has three albums in circulation. Baroni is both gifted, playing classical piano since the age of six, then later modern keyboards and synthesizers; and intelligent, earning a Master Of Computer Science and a degree from the prestigious School of Audio Engineering Institute in London. 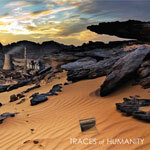 Traces Of Humanity is his fourth self-released album of keyboard and synth based music. Considering his education, experience, and talent, I was expecting the next Rick Wakeman or Keith Emerson. Let's just say I was a bit surprised, and disappointed. Additionally, many songs are plagued by scratchy radio static voiceovers that seem to offer story exposition, but instead come across as annoying. When joined by his partner Valentina Iacopinelli, the best vocal performances comes on 'The Spire' and 'Across.' The best songs trend toward a more progressive style and offer better arrangements; because of this, 'Under The Ground' and 'Across' are the only two songs I found genuinely interesting and satisfying. Andrea Baroni's Traces Of Humanity is an odd album: modern and eclectic electronica. Genuine fans of inventive(?) synthesizer and sampling use may be intrigued. The musical offering is so broad that it could be comfortable on the New Age radio show Echoes, within the psytrance movement, or even in an European discotheque. But not necessarily on my shelf or in my player.